1Jiangsu Provincial Key Laboratory for Interventional Medical Devices, Huaiyin Institute of Technology, Huai’an, China; 2Institute of Materials Science & Technology, Friedrich-Schiller-University Jena, Jena, Germany. Poly(ethylene glycol) (PEG) functionalized single-walled carbon nanotubes (SWCNTs) were covalently grafted on the titanium surface with the aim to provide a new platform for human osteoblast cells (HOCs) attachment. Water contact angle, X-ray photoelectron spectroscopy (XPS), and atomic force microscopy (AFM) results revealed that the PEGfunctionalized SWCNTs were successfully grafted onto titanium surfaces. 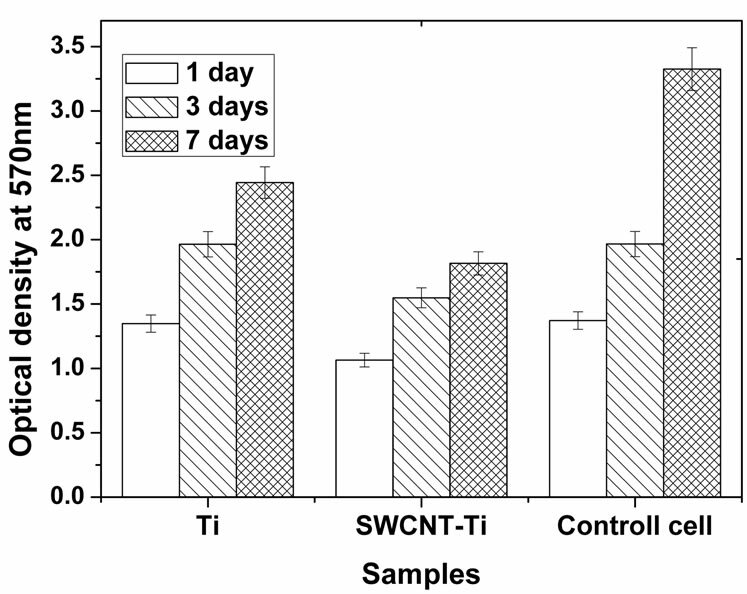 Cell viability and proliferation showed that the number of viable cells in culture medium increased with the incubation time for both titanium and SWCNT-modified titanium samples, although the SWCNT-modified titanium presented lower cell viability compared to titanium. Cell adhesion experiments suggested that there were no obvious differences in the number of cells adhered on the titanium and PEG-SWCNT-modified titanium, and the number of adhered cells increased with the culture time. To our best knowledge, for the first time the PEG functionalized SWCNTs were grafted on the titanium surface for human osteoblast cell adhesion and growth. The strategy introduced in the present study provides a new idea for the matrix preparation based on CNTs and titanium for the biological application and the new SWCNT-titanium platform has potential applications in implantable materials and bone tissue engineering. Carbon nanotubes (CNTs) hold a great promise in biomedical applications, such as drug delivery agents, biosensors, bone scaffolds materials, and others due to their unique structural, mechanical and electronic properties [1-6]. It has been reported that the modified CNTs can deliver peptides and ribonucleic acid (RNA) into cells without causing cytotoxicity [7-9]. Clearly, the studies that obtained good cell viability present some kind of purification (to remove metallic particles dispersed around CNTs and amorphous carbon) or functionalization of the CNT. Some researchers paid more attention to developing structure-controllable nanocomposites and 3D scaffolds for cell seeding and growth due to the high aspect ratio, stiffness and strength of individual CNTs [10,11]. However, the relative biocompatibility of CNTs has caused some controversy. For example, many studies show that CNTs have a cytotoxicity when dispersed in cell culture [12-14]. Some results have shown that both CNTs and functionalized CNTs can enhance cell viability and cell function [11,15-20]. Different conclusions from other studies indicated that both CNTs and functionalized CNTs could not increase cell viability and may even increase cytotoxicity in some cases [21-23]. The main reason for this phenomenon is that the biocompatibility of CNTs depends on many parameters, such as the CNT type (singleor multi-wall) and purity, the length of the tubes, and the type of functionalization as well as the molecular properties of the conjugated groups. In recent years, CNTs have attracted a great deal of attentions as bone replacement materials because of their biocompatibility with human osteoblast cells. A recent study showed that CNTs coated with poly(carbonate) urethane can provide very high nanosurface roughness which could provide greater hydrophilic surfaces although pure CNT surfaces were extremely hydrophobic . The modified CNTs also can enhance adsorption of fibronectin, which is well known to be critical for mediating the adhesion of anchorage-dependent cells, rendering enhanced cellular functions and tissue growth [24,25]. The osteoblast cell study on poly-L-lactide (PLLA)/MWCNTs (multi-walled CNTs) composites showed that the incorporation of MWCNTs into PLLA can obviously enhance the mitochondrial dehydrogenase (MD) activity . However, no significant differences of cell viability were found for PLLA/MWCNTs composites and controls. The authors believed that the composites had potential applications in bone tissue engineering. Overall, most current researches showed that the incorporation of CNTs into other biomaterials (polymer or inorganic ceramics) induced a nanostructural surface of the pores of composites which was thought to be beneficial for the cell attachment and proliferation . Titanium has been widely used in orthopedic implants, such as human bone replacement and dental materials due to its excellent mechanical, anticorrosive and biocompatibility characteristics . However, the limited surface bioactivity cannot modulate the interface biological reactions between titanium and living tissue, leading to some problems, such as poor binding ability to bone tissue. Surface modification of titanium holds a great promise to further improve its biocompatibility [29- 32]. In the past decades, many extracellular matrix (ECM) proteins were introduced onto the titanium surface to provide growth microenvironments of osteoblast cells [33-37], resulting in improved biocompatibility. Even so, so far the real bonding to bone has not been achieved after implantation in the early (<6 months) post-implantation period . A recent report demonstrated that the CNTs coatings on titanium surface fabricated by electrodeposition have excellent biocompatibility and can be used for surface treatment as a binder for cell-adhesive protein adsorption on the Ti surface . Compared with the titanium without CNTs, the parallel MWCNTs on titanium surface could enhance osteoblast functions, alkaline phosphatase activity and calcium deposition . One aspect that is characteristic of these CNTs on titanium surface is that the CNTs are physically adsorbed to the substrate. It is, however, desirable to covalently bind CNTs to the substrate. Functionalization of CNTs and titanium is necessary because both lack chemically reactive groups. Polyethylene glycol (PEG) has a low toxicity and is widely used in biomaterials. Functionalized CNTs with PEG could not only decrease the potential toxicity of CNTs but also provide the reactive groups on the surface of CNTs. In the present study, it was hypothesized that grafting CNTs on titanium surface can enhance the biocompatibility, i.e. cell adhesion and proliferation, of titanium substrate. The aim of this study was to test if the grafted CNTs on titanium surface can affect the biocompatibility of substrate. To this end, the titanium surface was functionalized to introduce isocyanate groups which can react with hydroxides on PEG-functionalized CNTs, resulting in covalently binding CNTs to titanium surface. This new substrate was used to provide the platform for human osteoblast cell attachment and growth. To the best of our knowledge, it is the first time to investigate the osteoblast cells behavior on the PEG functionalized SWCNTs scaffold. The present study could contribute toward the understanding of interactions between PEGfunctionalized SWCNTs and osteoblast cells and may have the potential application of CNTs in bone materials. The titanium samples were obtained by depositing pure titanium on silicon wafer by physical vapor deposition. The thickness of the deposited titanium film was approximately 50 nm. The silicon wafer was cut into 10 × 10 mm slides before use. The PEG functionalized SWCNTs were purchased from Sigma-Aldrich (Shanghai, China) and used as received. aminopropyltrimethoxysilane (APTMS), hexamethylene diisocyanate (HMDI), Dimethyl sulfoxide (DMSO), and tetrahydrofuran (THF). The other reagents used in this study were bought from VWR (Germany) if not specified otherwise. Scheme 1. Schematic diagram of grafting PEG-functionalized SWCNTs on Ti surface. and dried by high-pressure compressed air. The cleaned samples were then treated 5 min by O2 plasma. After rinsing with excess deionized water, the samples were immersed into 10 mM APTMS ethanol solution for selfassembly for 24 hours. The samples were then taken out and sonicated in ethanol and deionized water for 10 min, respectively. The self-assembled samples were immersed into the 100 mM HMDI THF solution. After reacting for 24 hours, the samples were sonicated in THF and dried by air, rendering an isocyanate surface. The PEG-functionalized SWCNTs were covalently grafted onto titanium surface by incubating the isocyanate surface with 1 mg/mL DMSO solution of PEGfunctionalized SWCNTs. The substrates were cleaned with water after reacting for 24 hours and dried by highpressure compressed air. The DSA10 drop shape analysis system was used to measure the water contact angle of all samples using Millipore water. The initial drop volume was 10 µL and the dosing rate was set to 10 µL/min for every measurement. The entire measurement consisted of 10 individual measurements, with one-second intervals, over which the average advancing contact angle and standard deviation were calculated. All measurements were performed at room temperature. The surface chemical structures of original titanium, APTMS, HMDI and SWCNTs-modified titanium surfaces were investigated by XPS. The XPS measurements were done by a Quantum 2000 XPS Apparatus (PHI Co., Chanhassen, MN) with a focused monochromatic Al Kα X-ray source (1486.6 eV) for excitation. The power of the X-ray source was kept at 25.7 W. Multipak software provided by the manufacturer and XPSpeak software were used for curve-fitting and data analysis. Measurements were performed at takeoff angles of 45˚. Nanoscope IV multimode AFM (Digital Instruments, Santa Barbara, USA) was used to examine the surface topography of titanium and SWCNTs modified samples using tapping mode at room temperature. Standard Si cantilever tips from Digital Instruments were used at 1 - 2 Hz of scan rate. The height and phase images were obtained simultaneously and all images were subjected to the first order flatten before further analysis. Osteoblasts (CAL-72), derived from human osteosarcoma (ACC439), were purchased from Wuxi BioHermes Co., Ltd of China. These cells were cultured in Dulbecco’s modified eagle medium (DMEM, Sigma) containing fetal bovine serum at 37 in a humidified 5% CO2 atmosphere. Subsequently, the cells were removed by trypsination, washed with DMEM, re-suspended in DMEM, and then used for cell study. The MTT assay is colorimetric assay for measuring the activity of enzymes that reduce MTT to formazan dyes which have a maximum light absorbance at 570 nm after dissolved in DMSO, giving a purple color. It can be used to assess the viability (cell counting) and the proliferation of cells because reduction of MTT can only occur in metabolically active cells and the level of activity is a measure of the viability of the cells. For MTT assay, besides cells deposited on substrates, other cells will remain in culture plate. Therefore, the cells remaining in culture plate could be used to indirectly measure the cells adhered on substrates because the seeded cells are same for each culture pores. In the present study, the purpose of MTT assay was used to investigate the effects of asprepared samples on cell viability in culture medium by measuring the percentage of viable cells cultured with samples to that of reference control culture plate. It also was utilized to examine cell proliferation by measuring the OD optical density of viable cells in culture medium when cultured with samples for different time. Osteoblast cell viability and proliferation were determined by MTT colorimetric assay. For this purpose, the titanium and SWCNT-titanium samples (each group had four samples) were sterilized with 75% ethanol for 12 hours and placed in culture plates. 2 mL of the human osteoblast cells, which were cultured in DMEM supplemented with 10% fetal bovine serum, were seeded in each well at a concentration of 10,000 cells/mL. The incubation was performed under 5% CO2 atmosphere and at 37˚C for 1, 3, 7 days, respectively. After each incubation period, the samples were removed from the respective wells. Subsequently, 10 µL of MTT (5 mg/mL) was added to each well, resulting in a final MTT concentration of 0.5 mg/mL. The cells were incubated for another 4 hours. The produced blue precipitate was dissolved by adding 100 µL of DMSO and incubated overnight. After complete solubilization of the dark-blue crystal of MTT formazan, the absorbance of the content of each well was measured at 570 nm with a 96-well microplate reader on a Power HT spectrophotometer (Bio-Tek Instruments GmbH, Bad Friedrichshall, Germany). The optical density is directly proportional to the number of living cells in culture. The results have been presented in percentage, adopting in 100% of transmittance for reference cells, i.e. cultures without blank titanium or PEG-SWCNTs modified titanium samples. The cell adhesion of human osteoblast cells on the titanium and SWCNT-titanium surfaces was examined at incubation periods of 1, 3, and 7 days, respectively. After each incubation period, the samples were gently rinsed twice with Phosphate buffered saline (PBS) to remove the non-adhered cells. The attached cells on the substrates were then fixed in 3% glutaraldehyde in 0.1 M sodium cacodylate buffer for 1 h and dehydrated in a graded ethanol solution (25%, 50%, 75%, 90%, and 100%) series for 10 min. After this, the samples were dried at room temperature for 30 min. Cell adhesion was evaluated by scanning electron microscopy (SEM, Leica S440i, Cambridge, UK) after deposition of a thin gold layer. Table 1 presents the water contact angle results of titanium surface after each modification step. The water contact angle decreased from 75.8˚ ± 0.26˚ for titanium surface to 66.9˚ ± 0.97˚ for APTMS modified titanium surface because of the introduction of amine groups after self-assembly of APTMS, which indicates that an APTMS layer formed on the titanium surface. The water contact angle further decreased after grafting SWCNTs although the CNT surface is extremely hydrophobic. Two reasons could contribute to this result, one is because the PEG molecules on SWCNTs surface have more hydrophilic activity, and another is because grafting CNTs on titanium surface could produce higher surface roughness at the nanoscale which provides larger hydrophilic surfaces . The water contact angle of HMDI reacted samples was not measured because the isocyanate groups can react with water during measuring contact angle, which leads to inaccurate results. Table 1. Water contact angle values for the modified samples. Table 2. Surface composition of the modified samples by XPS analysis. HMDI contains two nitrogen atoms in its chemical structure. The N1s density decreased after grafting CNTs because of the high increase of C1s. The decrease of Si2p intensity after each modification step is because the applied molecules cover titanium surface step by step, it also can be used to explain why the intensity of Ti2p decreased after each reaction. Figure 2 shows the C1s Gaussian-Lorenzian curve deconvolution of APTMSand SWCNT-modified samples. 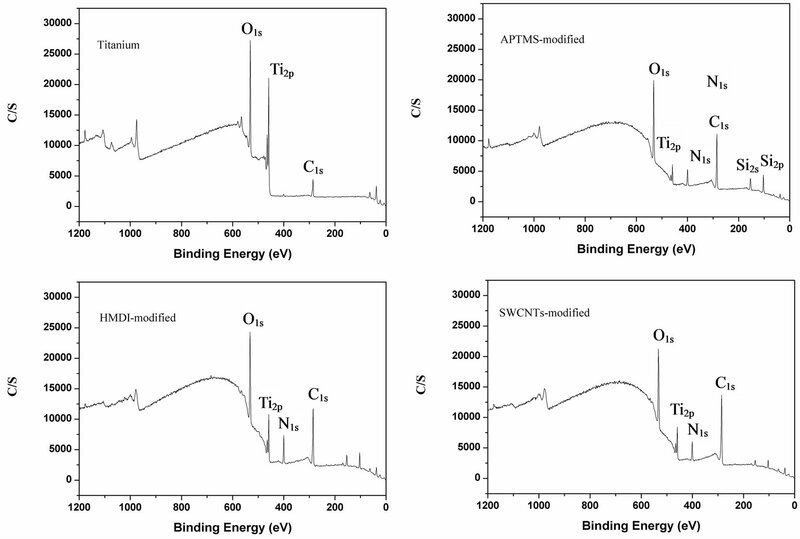 The C1s high resolution spectrum of APTMS-modified titanium sample can be fitted three peaks, which are corresponding to C−C (285.2 eV), C−Si (284.7 eV) and C−N (285.6 eV), respectively, which is consistent with the chemical structure of APTMS. 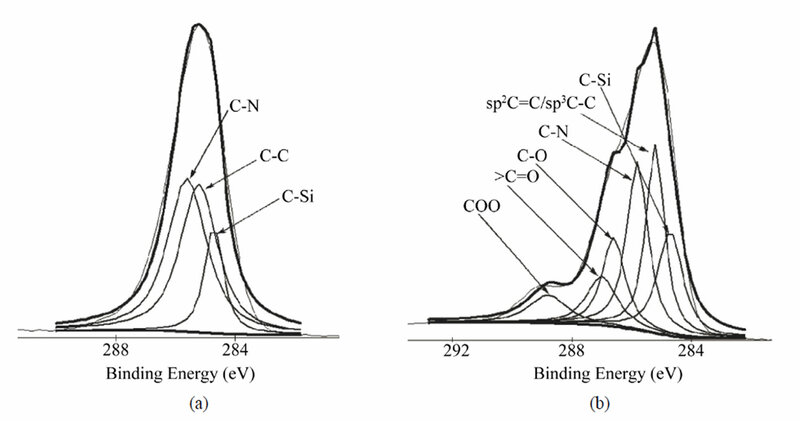 After grafting the PEG functionalized SWCNTs, in addition to sp2 C=C/sp3 C−C (285.2 eV), C−N (285.8 eV) and C−Si (284.7 eV), the occurrence of C−O (286.6 eV), COO (288.8 eV) and >C=O (287 eV) indicates that PEG-functionalized SWCNTs were successfully grafted on the titanium surface. In order to detect the existence of SWCNTs on the titanium surface, AFM was used to characterize the surface topography of modified and control samples. Figure 3 shows the AFM images of titanium and CNT-titanium. It can be found that SWCNTs were distributed on the titanium surface randomly. The nanosurface caused by immobilizing SWCNTs on titanium can provide more hydrophilic activity than titanium, which was confirmed by water contact angle experiments. Taking all these results into consideration, we confirmed that the PEG functionalized SWCNTs were successfully grafted on titanium surface. Figure 1. Representative XPS survey spectra of blank Ti surface, APTMS-modified, HMDI and SWCNT-modified Ti surfaces. Figure 2. Gaussian-Lorenzian curve deconvolution of C1s high resolution spectra of APTMS-modified (a) and SWCNTmodified (b) samples. Figure 3. AFM images of Ti (a) and SWCNT-modified Ti (b) surfaces. viable cells can express the mitochondrial dehydrogenase enzyme to cleave the tetrazolium rings of the MTT and form dark blue formazan crystals . Therefore, the MTT results can reveal the cell viability and proliferation. The cell viability obtained by MTT assays is shown in Figure 4(a). It was expressed as the percentage of viable cells cultured with samples to that of reference plate when cultured for the same time. The cell viability of osteoblast cells incubating on the titanium sample was higher than 95% after culturing 1 day and the value reached to about 100% after culturing for 3 days. The cell viability decreased significantly after culturing for 7 days, indicating that viable cells in culture medium containing titanium sample was less than that of reference plate, the cell proliferation in culture medium may have been prevented to some degree. For the SWCNTmodified samples, the cell viability was higher than 75% after culturing for 1 day and increased to 78% after culturing for 3 days, which means no toxicity after 3 days incubation. However, the same as titanium, the cell viability decreased remarkably after culturing for 7 days to reach 54%. It suggests that the SWCNTs-modified titanium surface could inhibit cell differentiation to some degree. On the whole, the cell viability of osteoblast cells culturing with titanium and SWCNT-titanium decreased with the increase of culture time. It suggested that, as compared to reference cell (the cells in culture plate without any blank titanium and SWCNT-titanium), both titanium and SWCNT-titanium could cause reduced cell viability in culture medium. So, the osteoblast cells cultured with titanium or SWCNT-titanium showed a relative low proliferation rate as compared with reference osteoblast cells. Even so, it does not mean that cell cannot proliferate when cultured with titanium or SWCNTtitanium. It is concluded that the titanium or SWCNTtitanium may have cytotoxicity when both of substrates were exposed to culture medium containing osteoblast cells. On the other side, more cells attached onto substrates when cultured more time may also contribute to decreased cell viability in culture medium. The increase of adhered cells would result in decrease of viable cells in culture medium. On the other side, it can be clearly found from Figure 4(a) that the cell viability of titanium is larger than that of SWCNT-titanium in the whole measure time, indicating that the growth rate of osteoblast cells culturing with SWCNT-titanium is lower than that of culturing with titanium. The decrease of cell viability may be related to the nature of the substance itself as well as to its surface state. Grafting CNTs on titanium surface provides nanosurface and more roughness which is very important for cell behavior , rendering decreased cell viability. The PEG on the CNTs may be another factor contributing to decreased cell viability. Figure 4. (a) Human osteoblast cells viability curve measured by MTT assay. The percentage of cell viability is calculated by adopting in 100% of transmittance for reference cells, i.e. cultures without materials; (b) OD values of osteoblast cells in culture medium when cultured for 1, 3, and 7 days, respectively. The change of OD values represents the cell proliferation of osteoblasts cultured in culture plate. optical density of osteoblast cells incubated with titanium was larger than that of SWCNT-titanium, suggesting more proliferation. Based on these results, it may be concluded that the PEG functionalized SWCNTs do not induce cytotoxic response and cells can adhere and grow on SWCNT-titanium surface because the cell number increased with the increase of culture time. From the data shown in Figure 4, it can be seen that the osteoblast cells can proliferate although there was a significant reduction in cell viability when cells were grown on CNT-modified titanium surface. So, the advantage of the present study may provide a new surface treatment method to prepare a novel platform for osteoblast cell adhesion. By altering the functional group (such as carboxyl group) on SWCNT surface and on titanium (such as amine, hydroxyl, etc), new surface treatment route would be developed. On the other side, it can be seen that titanium surface would become more hydrophilic after grafting SWCNT, therefore, the method in this study could be used to improve surface hydrophilicity of titanium and then the modified surfaces may be used in other biomaterials field such as blood-contacting biomaterials or non-fouling biomaterials. 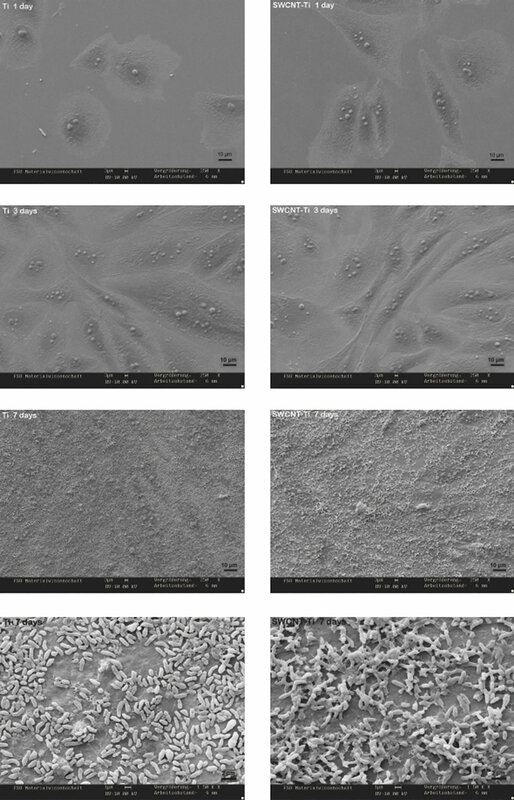 Figure 5 shows the typical SEM images of adhered cells on titanium and SWCNT-titanium when culturing for different periods. 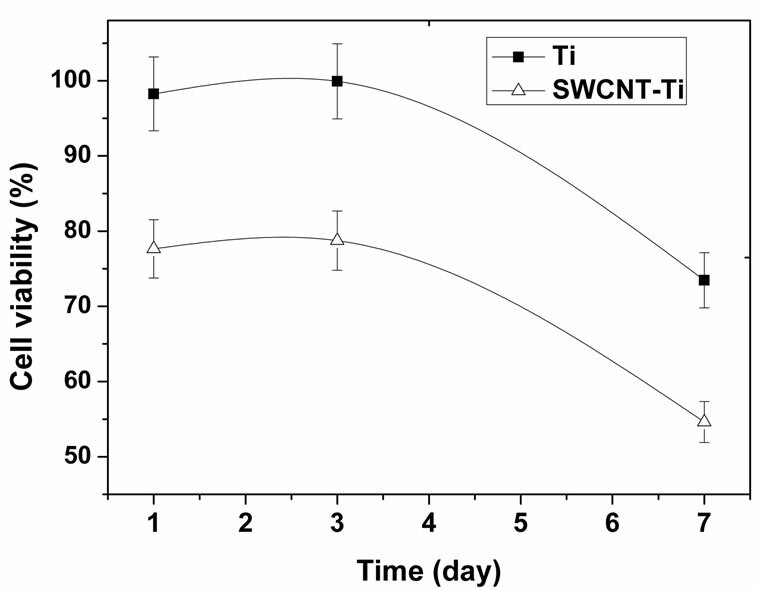 It can be seen that there was no obvious difference of cell adhesion between titanium and SWCNTtitanium when culturing for different time, indicating that the immobilized CNTs did not prevent cell adhesion and growth as compared with titanium substrate. The analysis of Figure 5 shows that the osteoblast cells adhered on both titanium and SWCNT-titanium spread flat to cover the sample surface after culturing for 1 day. It was suggested that the cell can adhere and spread well on both substrates. After 3 days of culture, the cells still spread well to encounter the neighbor cells to form a cell monolayer. The cells spread with no preferential direction, since they acquire a roughly flat form over the surface. It is well known that the adhered osteoblast cells on substrate could proliferate to form multilayer cells and the adhered cells will synthesize and secrete type I collagen so that it can mineralize to form bone nodule [35,36]. It appears from Figure 5 that after 7 days of culture the first cell layer may covered by many other particle-like substances which may be the proteins secreted by the adhered cells. These secreted proteins could provide extracellular matrix for hydroxyapatite (HA) growth to form bone. Whether these proteins can enhance cell adhesion and growth or HA growth will be confirmed in future work. The magnified SEM images further suggest that many particle-like substances form on the first cell layer. Clearly, it is not osteoblast cells. What are these particles and why the cells produce these particles will be further studied in future work. Also, it appeared that there was a tendency that more particles form on SWCNTs modified titanium substrate. It was suggested that the SWCNTs on titanium surface may enhance the function of adhered osteoblast cells. The overall observation showed that the PEG-functionalized SWCNTs were not obviously toxic to the osteoblast cells since the number of adhered cells increased significantly with increase of culture time and the adhered cells secreted proteins after culturing for 7 days. Figure 5. Representative SEM images of adhered cells on titanium and SWCNT-titanium, culturing for 1, 3, 7 days, respectively. The last two images show the larger magnification surface morphology of the Ti and SWCNT-Ti after culturing 7 days. that the grafted SWCNT had no cell toxicity because the optical density of living cells increased with the increase of culture time. Cell adhesion results suggested that there were no obvious differences between unmodified titanium and SWCNT-titanium. The results of this present study suggested that the SWCNTs grafted on titanium had no cytotoxicity for osteoblast cells, demonstrating its potential as the orthopedic materials. The strategy introduced in the present work provides a new idea for the matrix preparation based on CNTs and titanium for the biological application and the new SWCNT-titanium platform has potential applications in implant materials and bone tissue engineering. This work is financially support by the Natural Science Fund of China (30900294) and the Scientific Research Foundation for Returned Scholars, Ministry of Education of China (2010-1561). M. Dettin, A. Bagno, R. Gambaretto, G. Lucci, M. T. Conconi, N. Tuccitto, A. M. Menti, C. Grandi, C. Di Bello, A. Licciardello and G. Polzonetti, “Covalent Surface Modification of Titanium Oxide with Different Adhesive Peptides: Surface Characterization and OsteoblastLike Cell Adhesion,” Journal of Biomedical Materials Research A, Vol. 90, 2008, pp. 35-45. L. Bacakova, V. Stary and P. Glogar, “Adhesion and Growth of Cells in Culture on Carbon-Carbon Composites with Different Surface Properties,” Journal of Biomaterials and Tissue Engineering, Vol. 2, 1998, pp. 2-5.